Died: The Greek Church says she died in Ephesus of natural causes. Her relics were transferred to Constantinople in 886 where they remain today. Saint Mary, whom Jesus converted, and who witnessed His last moments with Mary, His Mother, and Saint John, was called Magdalene from the town of Magdala in Galilee. Clement of Alexandria and others identify her with the woman who washed Jesus' feet with her tears. Others regard her as Mary, the sister of Martha and Lazarus. She followed Jesus with other devout women during His public life. After His resurrection, Jesus appeared first to Mary Magdalene and then to His Apostles. It is an ancient tradition in Provence, France, that Saint Mary Magdalene or Mary the sister of Lazarus, together with Lazarus, Martha, and some other disciples of our Lord, being expelled by the Jews, put to sea and landed at Marseilles; and that Saint Lazarus became the first Bishop of that See. The feast of Saint Mary Magdalene is celebrated by the Greeks, as well as the Latins, on this date. However, in the instruction given with the latest edition of the Roman Calendar, the Latin Church has stipulated that the feast is solely that of the woman to whom Christ appeared and not that of the sister of Lazarus or the penitent woman. 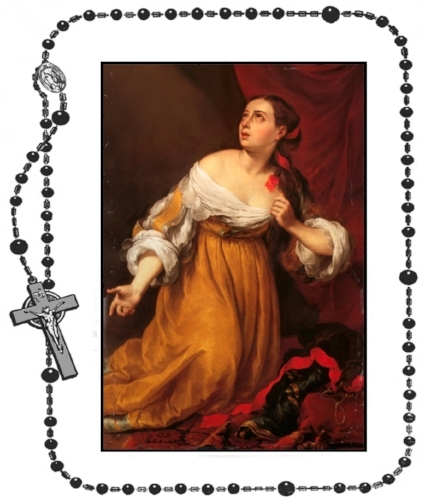 Prayer: God, it was to Saint Mary Magdalene before all others that Your Son committed the message of Easter joy. Through her intercession may we one day contemplate Him reigning in glory. Amen.